Do you use Twitter, that short, succinct message system? I don’t but as of last weekend the Tuis have definitely been in touch with each other in their own twittering way. You may remember my post at the beginning of the month detailing the facilities we offer to Tui. 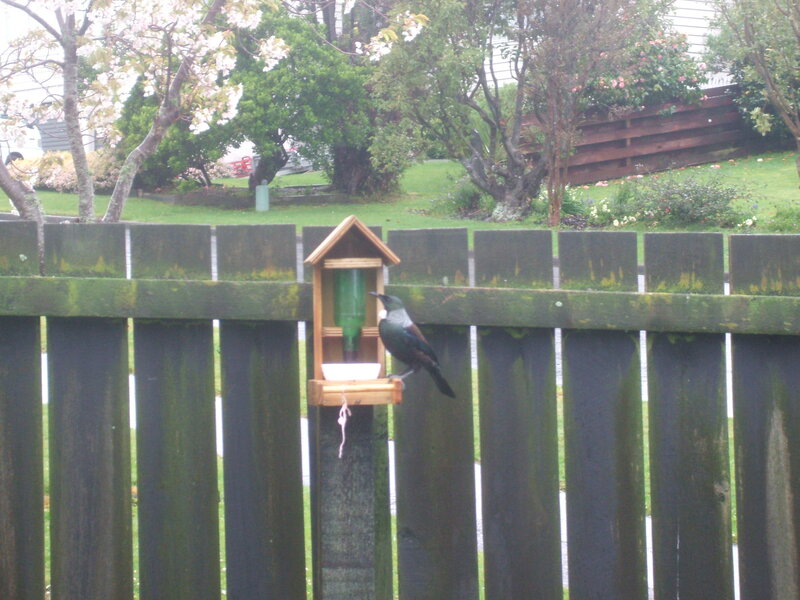 At that point I was still waiting for a Tui to find and drink from the nectar feeder we have put up in the garden to supplement their food supply. Well someone has sent out a “tweet” in the Tui world…..
My patience has been rewarded with Tui now calling regularly to the feeder and, along with the many wax-eyes who visit it, cause it to empty in around 48 hours. 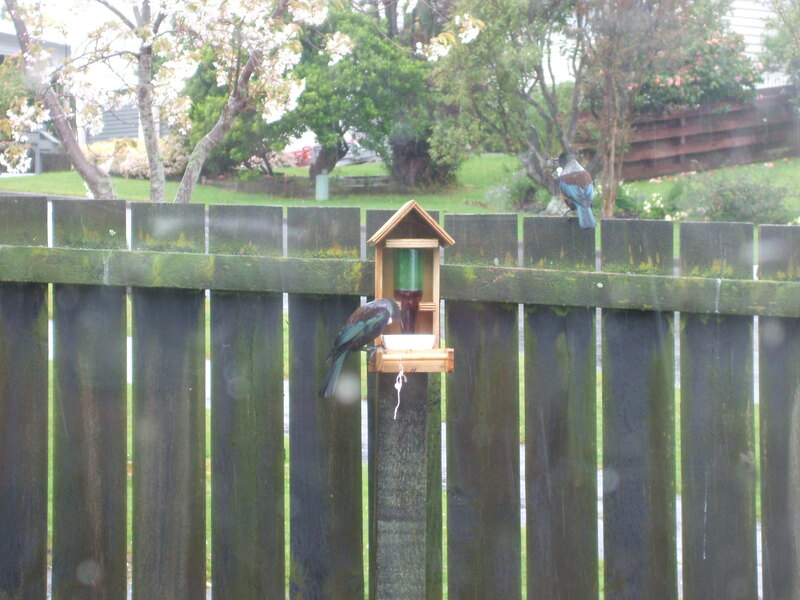 We have all enjoyed watching the Tuis arrive and drink their fill of the sugar/water combination. While taking sharp, close-up photos has been a challenge, we have been able to spy their long, narrow yellow tongue which they use to brush nectar from flowers and which plays some role in their ability to drink. and then on to the feeder. They are nervous and watchful and generally do not loiter, although on rare occasions one might perch on the fence and sing for us briefly. 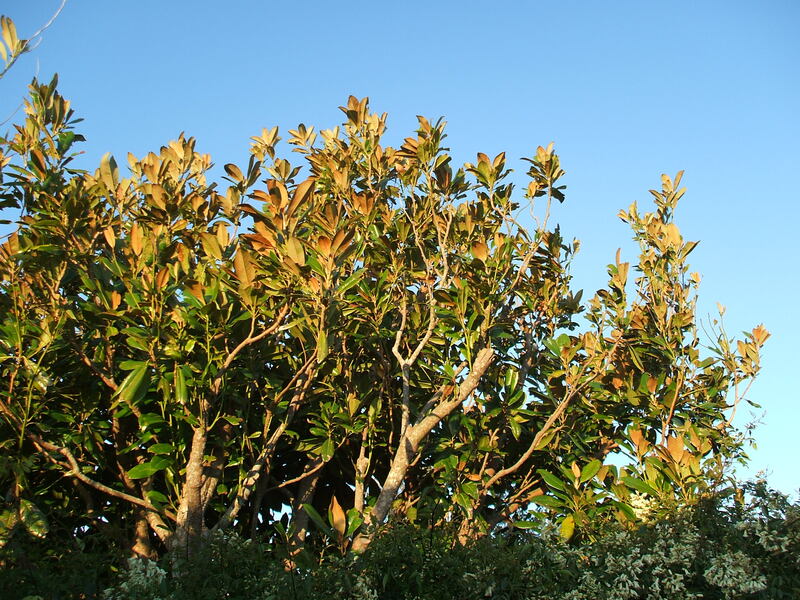 Generally they prefer to sing from this tall Magnolia. I hope you can see something of their gorgeous plumage. On sunny days this is particularly striking with its turquoise iridescence set against strong black and white feather patterning. What a delight to have Tui call in the garden in such a clear vantage spot. This entry was posted in Uncategorized on September 28, 2013 by ordinarygood. Well, the call has certainly gone out and the tuis know that they are on to a good thing. What a thrill to be able to see them at such close quarters. It is a real delight to be able to watch them through the windows. The majority of local Kowhai trees are almost finished flowering now so it will be interesting to observe the Tuis using the feeder. They may have to go further afield for flax flowers or the red flowering gum trees. How much fun is this! And the Tui come so well dressed to dine 🙂 Do you find that one bird always seems to come first as a ‘scout’ then flies off to report its findings? This is what appears to happen here when I put food out for the wax-eyes. Perhaps Tui behave differently. I am smiling every time I spy a diner and that has been often in the past week. While well dressed the Tui are a bit sloppy in their supping but I think that is due to anxiety in such an open environment with a footpath and road quiet close by….plus the human spectators. I wish I could report to you on how it all began and who told who but perhaps the advance guard of wax-eyes tweeted to the Tuis. The syrup is coloured red to catch the eye of the Tui. They were visiting the flowering cherry tree ( in the background of the photo) to sup on the nectar in the early blossoms so perhaps they spied dessert from there. 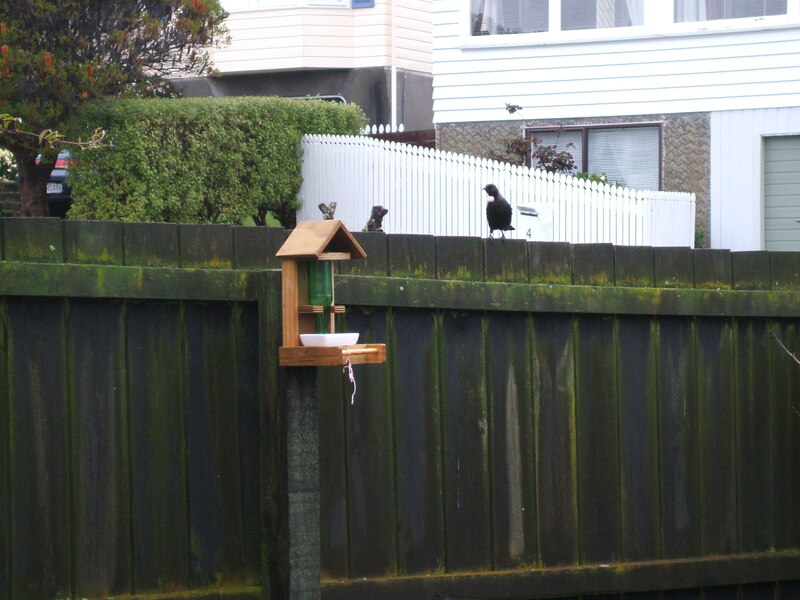 I am trying to see if I can observe a difference in the visiting Tuis but nothing scientific has emerged yet…. LOL! Sloppy supping! Yes, quite possibly they were watching the wax-eyes for information because here it is the wax-eyes who are the advance guard on food; then the sparrows; followed by the bigger, noisier birds. And the different birds take turns at the food in a very co-operative way. Sloppy slurping could be a description too. I gather Tui have very sharp eyes and can fly long distances to find their food. I have a blackbird who is always watching for food and I note that the sparrows turn up as he does. They do share quite well. Do you remember Mr Thrush and his endless arias? He and his mate have been around but now I just see him with his beak bursting with worms and off he flies:-) All the rain we have had has meant lots of worms for the Thrush family. Ah, so there are little babies somewhere?? He is a successful songster. I like that your birds work co-operatively. It must be your diplomacy background!!! Mr Blackbird, my friend, is not keen on other Mr Blackbirds…..there is a lot of running at the intruder….tee hee. I should have said each type of bird works co-operatively with the other types of bird. The starlings will squabble with each other and the wax -eyes will ‘fight ‘each other for the best bits. But the wax-eyes will let a bigger bird have some food, then will push their way back in again, as if to say, your turn is up; it’s our turn now. I like your accurate observations. 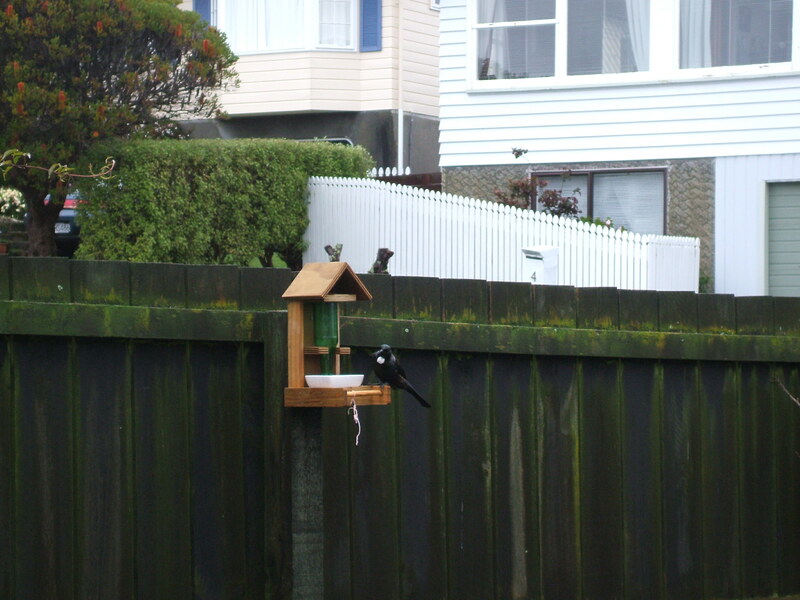 I am really pleased…..but also puzzled about your Tuis. I do notice we get more visitors when the weather is cold. Any sign of a Bellbird who might partake of the sugar water? I am hopeful of that in time….and I am pondering another nectar feeder….Xmas is coming. I don;t think we have that many here yet but there is hope more will make this area home. It is the same here. There seems to be one bird that is a “scout” that tells the rest of the flock about the seeds we put for them. Birds are so interesting aren’t they?